BCI Asia, the publisher of FuturArc, aims to improve built environments by assembling the principals of Top Ten firms with green building academics and practitioners from around the world as we as representatives of large property development companies, engineering firms and building technology providers. The presentation ceremony of “Top 10 Awards 2008” was held at Swissotel Le Concorde Bangkok on March 18, 2008. 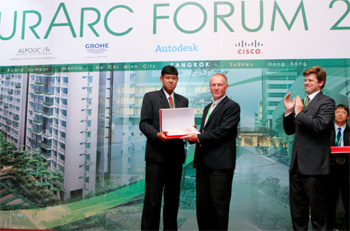 The awards are for the 10 excellent leading architecture companies in Thailand of the year 2008, ranking by BCI Asia. In collecting data on this year’s Top Ten, BCI Asia conducted about 300,000 interviews with architects, developers, engineers and contractors. Its research staff also followed tenders, visited sites and reviewed municipal records to ensure accuracy. The Top Ten winners had the highest accumulated value of active projects in their portfolios reported in BCI Asia’s e-bulletin/Landmanager service in the year to September 2007. First left, Managing Director of BCI Asia Construction Information Co., Ltd., Mr. Jeerakit Thudsri presented “Top 10 Awards 2008” to Mr. Donal T.Coyne, Managing Director of Steven J. Leach Jr, & Associate Limited.